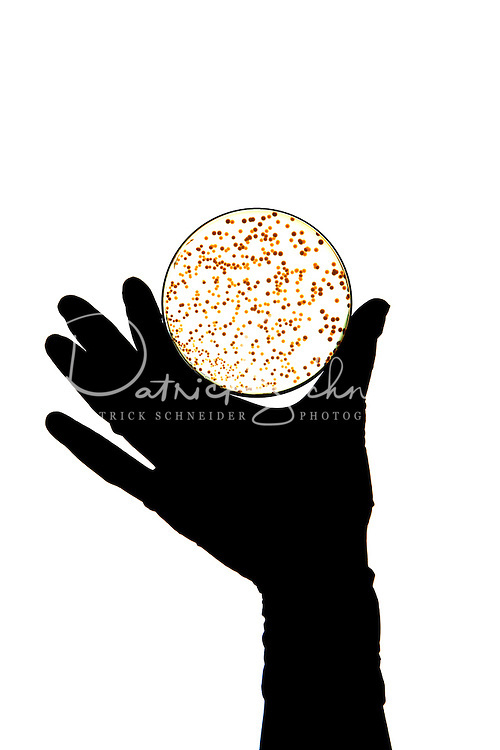 An employee of Microban International Ltd. in Huntersville, NC, (north of Charlotte, NC) examines an agar petri dish containing Klebsiella pneumoniae, or Staphylococcus aureus (S. aureaus). Microban Intl engineers antimicrobials, which kill or inhibit the growth of microorganisms, such as fungi, bacteria or protozoans. Microban is a global leader in built-in antimicrobial product protection. The company engineers durable antimicrobial solutions for consumer, industrial and medical products worldwide. Microban was founded in 1994 by three biomedical engineers, who use proprietary processes to engineer antimicrobial ingredients into solid products. Now an international company, Microban develops antimicrobial solutions that give consumer, industrial and medical products an added level of protection against damaging microbes such as bacteria, mold and mildew that can cause stains, odors and product deterioration.